LiveTiming is a desktop application, based on rFactorWebView. 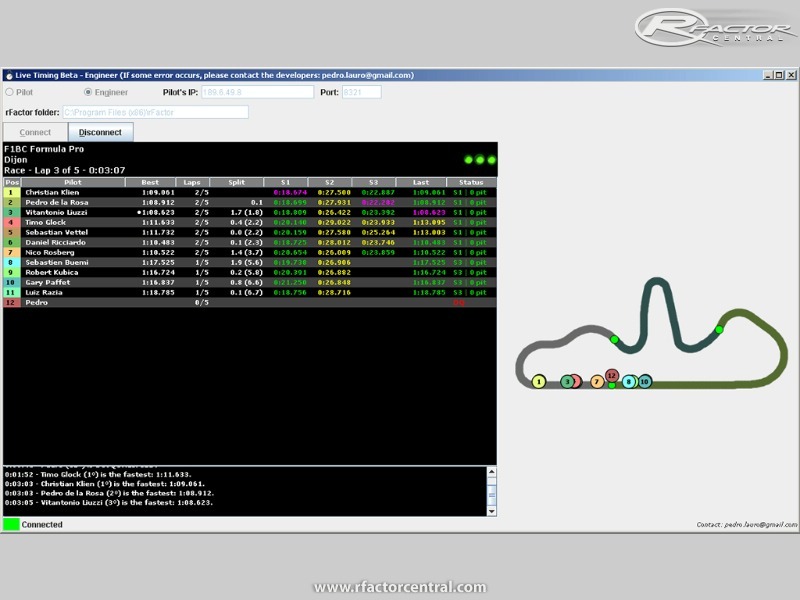 It’s designed, as rFactorWebView, to display all driver information, including lap times, sector times, splits, status and the current location of each driver on the circuit. But, as a differential for rFactorWebView, it’s a desktop application, and can be run without difficult installation. It just requires that you have Java installed on both machines of the pilot and the engineer. Stunning knowledge purchasing from this individual exceptionally persistent with questions, gave extra photograph/video Do My Essay For Me, and the sack is lovely and clearly very much nurtured. Dazzling extra things as an additional astonishment I would 110% purchase from this beautiful client once more!!! Here the some many simple points just following this and solved your problem,you can easily to remove your browser history http://deletebrowsinghistory.net/ so if you want to remove your entire all browser history,it is very simple process,such a great way. Wondering if anyone has a download link for this version? Would very much appreciate it. Hi, do you have the original files for WebView? If so could you please share them. So, I need more info on what you've done. Did you followed all the steps on the tutorial? Was the IP, Port and rFactor folder that you informed on the app corrects? Did the app showed some error message on the bottom of the window?